Image courtesy of the author. NW Noggin is an art and neuroscience outreach program started in the spring of 2012 by neuroscience instructor Bill Griesar and artist Jeff Leake. Bill and Jeff met on the playground at their children’s elementary school in Portland, Oregon. One afternoon while discussing brushwork and brains, it became apparent that there were a great many things that these two disciplines have in common, from the interest in how and why we perceive the world the way we do, to the question-driven exploration of what it means to be human. We began to imagine what an art and neuroscience course might look like. That summer we brought together graduate and undergraduate students from Portland State University (PSU), Oregon Health & Sciences University (OHSU), the Pacific Northwest College of Art (PNCA), and Washington State University Vancouver (WSUV), and partnered with a local after school program called Schools Uniting Neighborhoods (SUN) to teach our first STEAM course to an enthusiastic group of middle school students at Sabin Elementary. Nervous system drawings at Sabin K-8 in Portland. Image courtesy of the author. Through the development of that first STEAM class the value of arts integration in science education quickly became apparent and would guide the core principles of our organization. We work with thousands of students we wish to enthuse about science, art, and about their own educational experience so that they will thrive well past high school in creative pursuit of their own goals. Many of the young minds we work with have disengaged with school, so one of NW Noggin’s goals is to motivate them about learning by directly addressing how students learn. A student's success is at least partly dependent on their exposure to content that is interesting and challenging enough to be motivating. This includes how the material is delivered. A STEAM approach allows us as teachers a broader palette from which to differentiate our lessons. At their best, arts integrated classrooms inspire students to explore material in a way that encourages multiple solutions to the same problem. It also impacts how we gauge student learning. In our opinion, “fill in the blank” and bubble tests, while not entirely without value, have failed to accurately measure or support student achievement, and should not comprise the primary means of assessment in the classroom. NW Noggin approaches this challenge through three basic types of activities. 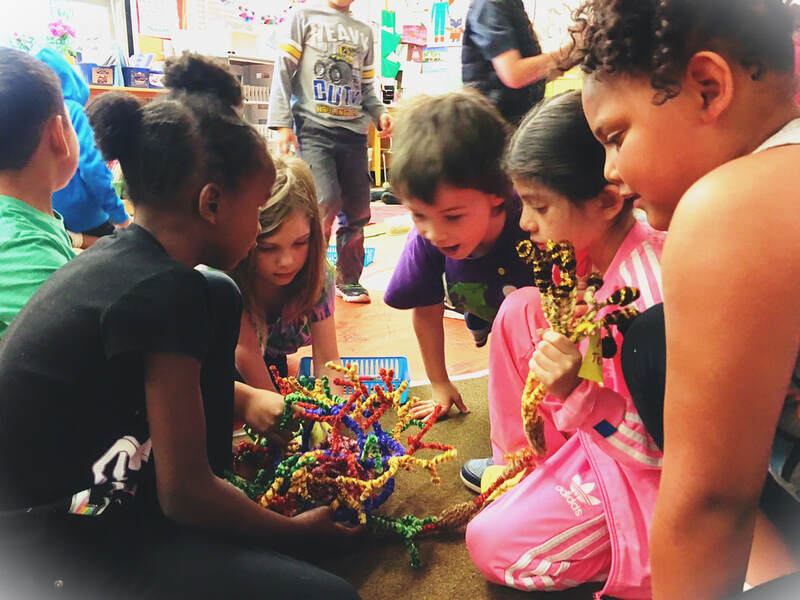 We offer projects like our pipe cleaner neurons that are direct, interpretive representations of physical structures or processes. More than simple illustrations, these efforts allow students to embellish the basic physical facts of important biological structures which aids in both exploring and remembering what these various components (dendrites, cell bodies, axons, etc.) do. It also allows us as teachers to apply these lessons in multiple classroom settings, and in fact we have taught this project successfully with kindergartners all the way up to college students, varying the complexity from archetypical brain cells to detailed representations of specialized sensory neurons like rod or cone cells in the eye. We also have projects that serve as visual and tactile examples of complex biological processes such as our blind touch sculptures, where we ask students to recreate an object they can’t see by touch alone using clay. This is a very direct example of how our tactile system gathers, interprets, and perceives information. These projects allow our students numerous ways to understand important concepts in neuroscience. Lastly, we have projects that let students explore topics and ideas in a way that can be assessed for understanding while accommodating a wide range of solutions. For example, we often ask students to create visual metaphors for an aspect of a neuron’s function (such as the action potential). These neuron metaphors require an understanding of the basic function of a brain cell, but also allow students to approach these questions in a way that is personally relevant and can accommodate many, often surprisingly compelling and innovative solutions. Neuron gel prints in LaGrande Oregon. Image courtesy of the author. We have also found that discussing how we perceive the world around us by examining artwork is an effective method of STEAM instruction. At Portland State University, we regularly take our undergraduates on a unique neuroscience tour of the Portland Art Museum. We explore how many artists have an intuitive or in some cases explicit understanding of how stimuli affect our brains, our bodies and our conscious emotional experiences, contributing to extraordinary works that affect our perception and felt experience of ourselves and our world. Since 2012, NW Noggin has worked with more than 14,000 academic priority K-12 students in the Pacific Northwest alone. We’ve also expanded the scope of our program to include many other community partners. For example we’ve collaborated with p:ear, a local drop-in center for homeless youth, and organized a series of events using art to spur conversations about the effects of everything from sleep and stress to drugs on your brain. Last spring we were invited to Washington, D.C. for an exceptional, high profile experience presenting on brains and discussing the importance of STEAM education with members of both houses of Congress, the Office of Science and Technology Policy (OSTP) at the Obama White House, fourth graders at two Title I D.C. public schools, and visitors to the Phillips Collection. We also ran a popular “Neuroscience Night” at the Phillips, in conjunction with the “Seeing Nature” exhibit of landscape paintings from Paul Allen’s private collection. NW Noggin first contributed STEAM text, graphics, and educational materials to this exhibit when it opened at the Portland Art Museum in fall of 2015 for “The Nature of Seeing,” an associated gallery inviting museum goers to engage with both the art and neuroscience of vision. Pipe cleaner neurons in San Diego. Image courtesy of the author. For years now, we’ve also organized a series of NW Noggin SciArt collaborations at Portland’s premier bicycle repair shop and pub - Velo Cult - where we pair a graduate student from an area research lab with a local artist. We bring them together to discuss what their practices have in common and to develop a joint public presentation. These very popular events combine artwork and activities with current federally funded research, offering participants a unique opportunity to think about and present their work to a lay audience. We always write up detailed blog posts about these experiences, with pictures and links to both art sources and relevant NIH-funded research, and have enjoyed incredible multi-media presentations on subjects ranging from depression, epigenetics, pain, drugs, music - often with musical performances, holographic brains, and other large scale art installations representing, for example, the molecular scaffolding around synapses known as perineuronal nets! Over the past five years we have found this NW Noggin STEAM approach to be extraordinarily effective not only in building excitement and awareness of discoveries in neuroscience for K-12 and the public, but perhaps even more importantly, as a valid and indispensable means by which we can expand how we learn about and experience the world around us. Discover more at nwnoggin.org! A California bay area native Jeff Leake holds a BFA from the San Francisco Art Institute and an MFA from UC Davis. Fascinated with the origin and nature of our inner landscapes he currently works with neuroscience faculty at Washington State University Vancouver and Portland State University to teach art and neuroscience there and around the Portland area. He is also the co-founder and art coordinator of NW Noggin an art and neuroscience outreach group. As part of this he has been all over the country lecturing and teaching neuroscience through art including several lectures on art and drugs for Science On Tap, the Portland Art Museum, and the Washington State Psychological Association. Along the way he has shown nationally and internationally, he now lives and works in sunny Portland Oregon with his wife kids and three dogs. Subscribe once, be set for life! One time payment, no renewals. ​Upon purchase, your digital access code will be automatically emailed to you. For gift purchases, simply forward or print out your confirmation email.